The purpose of this camp is to give youth a fun, safe, and educational opportunity outdoors. 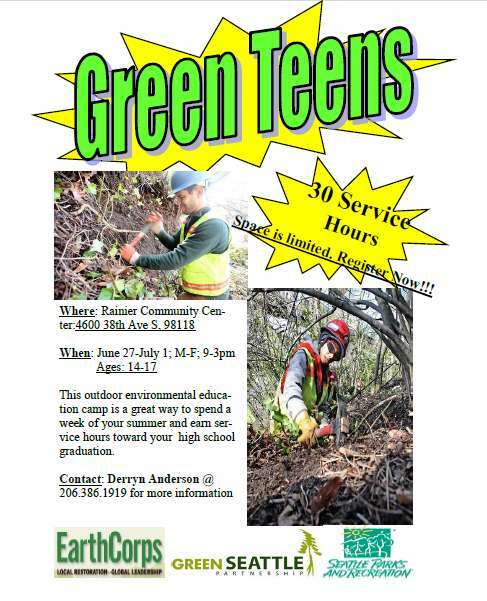 This camp is hosted by Rainier Community Center and will take place at Cheasty Green Space on Beacon Hill. Participants of this camp can earn up to 30 service hours toward graduation. To register contact Derryn Anderson at Rainier Community Center, vog.elttaes|nosredna.nyrred#vog.elttaes|nosredna.nyrred, 386-1919.